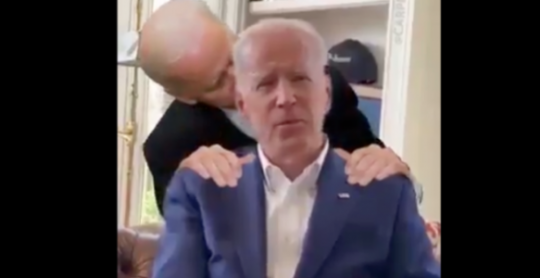 I hope you're sitting down: did you know the video President Donald Trump tweeted out of Joe Biden walking up behind Joe Biden and groping Joe Biden … was doctored????? Now call me a pedant, but my sense is that "doctored" is a term generally used for editing with an intent to deceive. A quick Google search confirms that sense; the first result is "change the content or appearance of (a document or picture) in order to deceive; falsify." It's not really supposed to be used for obvious and overt parody. "President Trump posts altered/parody/joke video mocking Joe Biden" would've been a fine headline that doesn't insult one's intelligence. That said, I'm not actually sure whose intelligence is being insulted here. Do these outlets really think we need to be told that Biden does not actually have a twin, a clone, or a subterranean scissor-wielding doppelgänger? Do they think the White House thinks we might think that? I guess the important thing here is they get to scold someone. We've seen this misleading use of "doctored" before, when CNN complained the White House shared a "doctored" video to support banning their reporter Jim Acosta from press conferences after he made contact with a White House intern. CNN complained that frames were cut from the video and that it was "sped up," a line parroted by the media at large. The creator of the gif, Paul Joseph Watson, strongly denied altering the video in anyway other than zooming in; the media didn't take the Infowars host at his word. But it turns out they should have. Buzzfeed's analysis found that the "edits" were far more likely a natural result of converting the video to gif form. "There's no evidence that the video was deliberately sped up—but the change in format, from a high-quality video to a low-quality GIF, turns the question of whether it was ‘doctored' into a semantic debate," they wrote. The Buzzfeed analysis resulted in multiple retractions, dozens of reporters deleting their tweets, CNN apologizing to the White House … ha ha ha, no, that didn't happen. It's all still up, even though the video was only "doctored" to the extent that news organizations "doctor" video on a daily basis. But that thin "semantic debate," as Buzzfeed put it, gave them the leeway they needed. Coincidentally I'm sure, the media pearl-clutching about the "doctored" video mirrors the proto-Biden-campaign's line that the criticism of his conduct is actually due to "photoshopped images" and "smears and forgeries." Needless to say, the bulk of Biden edits are very obvious parodies lampooning his behavior. I'm sure some people have fallen for them, yes. But some people are morons. I'll conclude by allowing it's perfectly legitimate to criticize Trump for tweeting out the Biden video, just as it was perfectly legitimate to criticize the White House for outsourcing its comms work to freaking Infowars. Would the media have been equally appalled if President Obama had tweeted out a childish meme mocking Mitt Romney? Eeeeeh, I'm inclined to think they wouldn't. It probably would've been taken as evidence of how hip and down with the kids he was, alongside him slow-jamming the news and chatting with cereal-bathing YouTube stars. In any case, the Trump video should at least be criticized on its own terms and not as if it were some failed attempt at deception. This entry was posted in Politics and tagged CNN, Joe Biden. Bookmark the permalink.